Fishing around Sooke and Victoria has been pretty fun lately. Trevor from No Bananas Fishing reports: "Halibut fishing is red hot with fish every trip -- almost limited every day last week. Halibut catches have varied from 20lbs to 100lbs and have been caught from right off the waterfront all the way out to Border Bank." 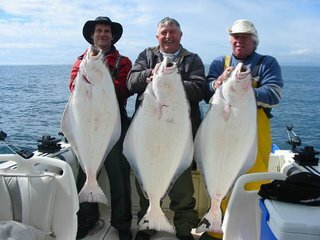 Gord from Foghorn Fishing Charters provides a similar halibut report, with many of these fine white fish caught over the past week. 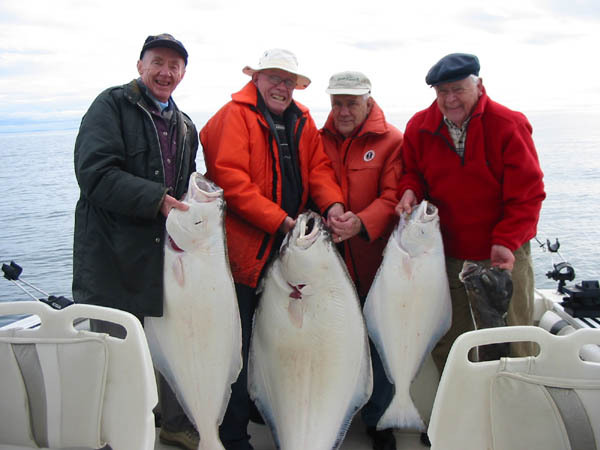 "Here's Alex, Nigel, Vince, and Bill...these good old boys had a great day fighting halibut and winning! Alex at 81 years young landed his first halibut, a 40 pounder. Below that is K-Noot, Max, having a day off work. Everyone had lots of fun." Additionally, Gord's guests reeled in some nice salmon up to 15 pounds. The big ones had to be released, due to the Fisheries "slot limit" regulation, but there's still the fun of reeling them in. They did get to keep a few nice "dinner fish" for the BBQ.